Ready to dive back in? We’re going to pick up at the point where we have finished selecting and preparing our pillowcases for sewing…Except, first we’re going to take them apart! Each of these pillowcases had one side seam and a top seam. I used a seam ripper to open all of these. I opened the seams all the way to the edge, even though that meant that I had to undo some of the stitches holding the finished hem together. I love to save these easy steps for the evening so that I can hang out with Jeff on the sofa and watch TV while I work. 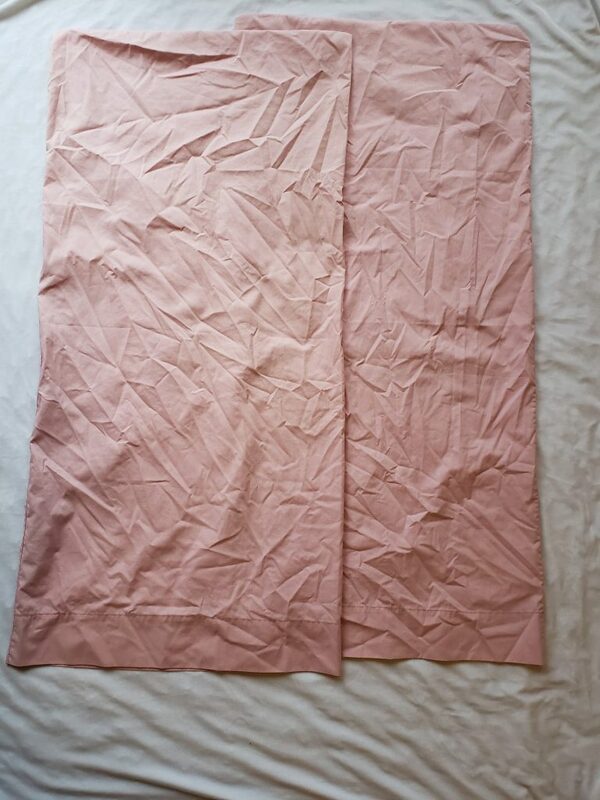 Frequently, pillowcases are merely serged together, to combine the steps of binding raw edges and seam sewing into one. 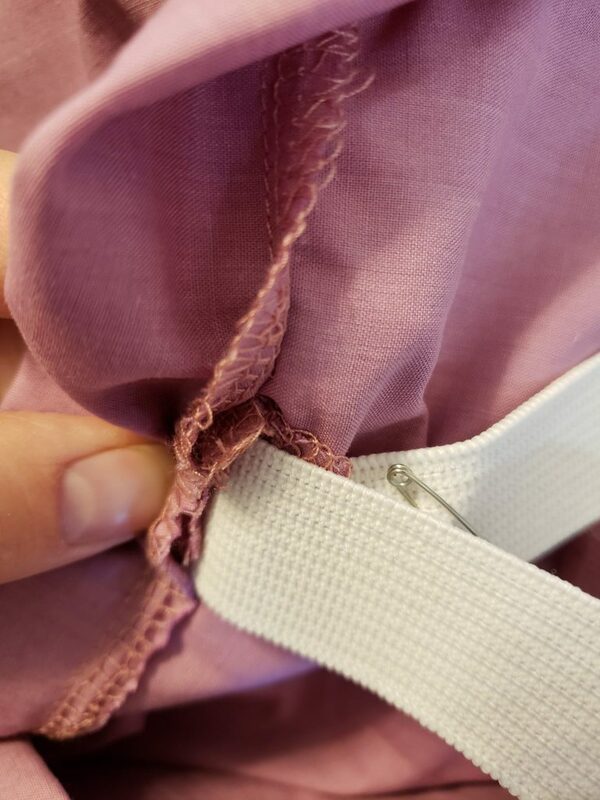 Picking apart serging is more time-consuming than opening a standard seam, because there are more threads. This was the case with these pillowcases. 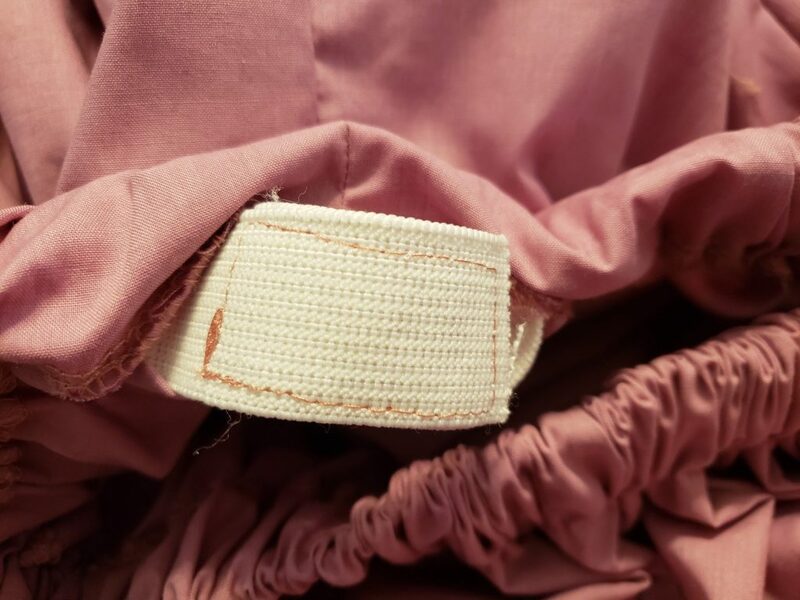 So, in the process of opening the seams, I was also taking apart the stitching that protected the raw edges from raveling. At this point, I could have left the edges raw, but I chose to serge them to prevent them from fraying over time. I pinned the opened pillowcases to each other, wrong sides together. Then, I stitched the side edges together to form the new side seams for the skirt. Then, I folded the original hem back up and stitched it back down. Next, I chose some elastic from my stash. I prefer a width of at least 1 inch for waistbands. I folded over the top edge of the pillowcases to find the width I needed to form an elastic casing. I included a bit extra for seam allowance. Then, I marked the width along the top edge of the skirt using a purple, Dritz Disappearing Ink Marking Pen. I’m a big fan of these. I use them in nearly every project! I stitched around the folded, top edge of my skirt to form a tunnel for my elastic. I left a small opening at one of the side seams so I could insert the elastic. *Disclaimer* I am an Amazon Services LLC Associates Program member. Any purchases made through my Amazon links will earn me a small commission. I am careful to only promote products that I have personally used and love! 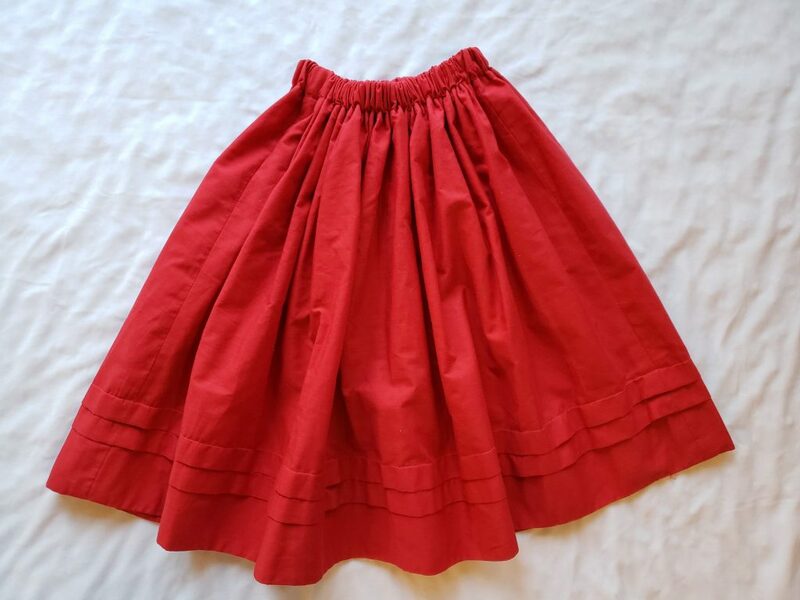 If you haven’t already, here’s where you’re going to need to stop and take the measurements of whoever is going to be wearing this skirt! I had Emma find her waist for me. I had her tip to the side and put her finger where she felt her torso fold. THAT is where the natural waist lies. It’s around the bellybutton line, not the hips. 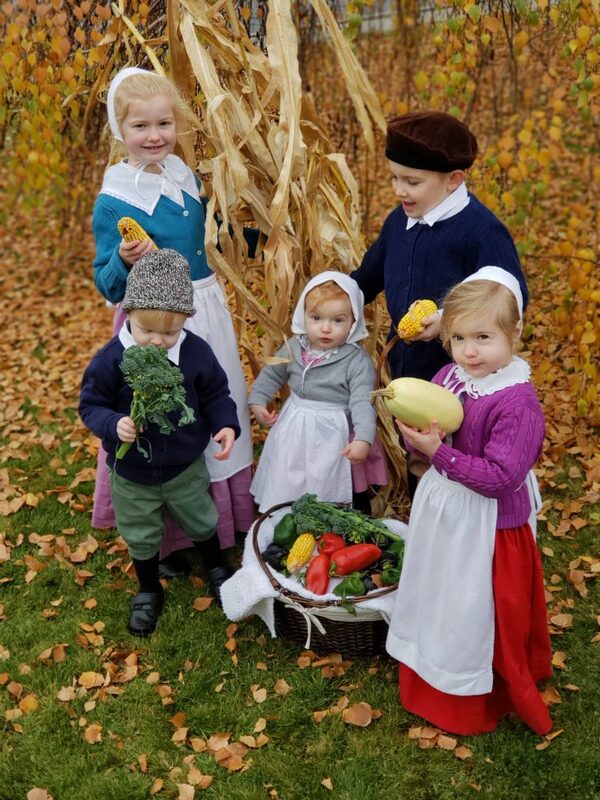 (Kids these days!) Then, I measured Emma’s waist at this point. I pinched the tape together with a finger between her body and the measuring tape. This helps to build a little bit of ease into the measurement so that I don’t make the waist too tight. I wrote this measurement down and went on to take a length measurement. Then, I had Emma hold the tape to her waist while I stretched it to the floor. I decided that I wanted her skirt to hit her about ankle length. I wrote that measurement down. 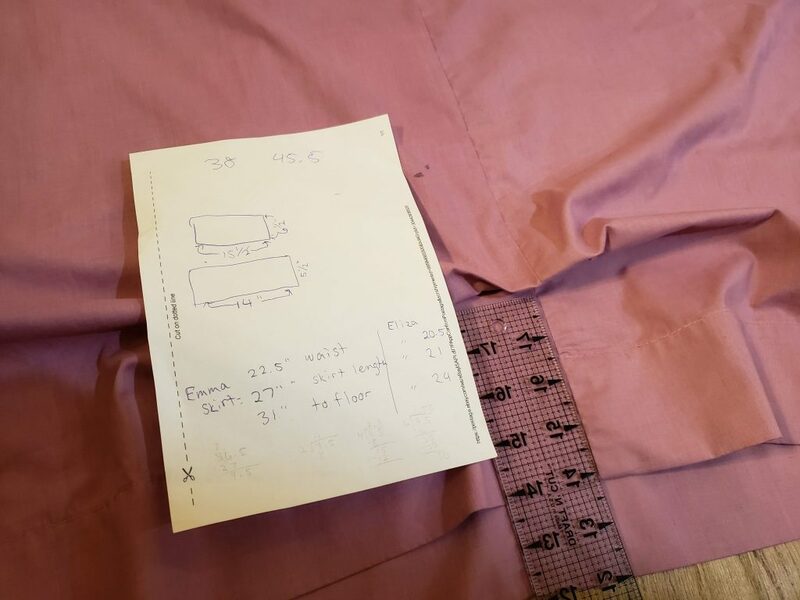 With the measurements in hand, you can determine how much elastic you need for the skirt waistband! 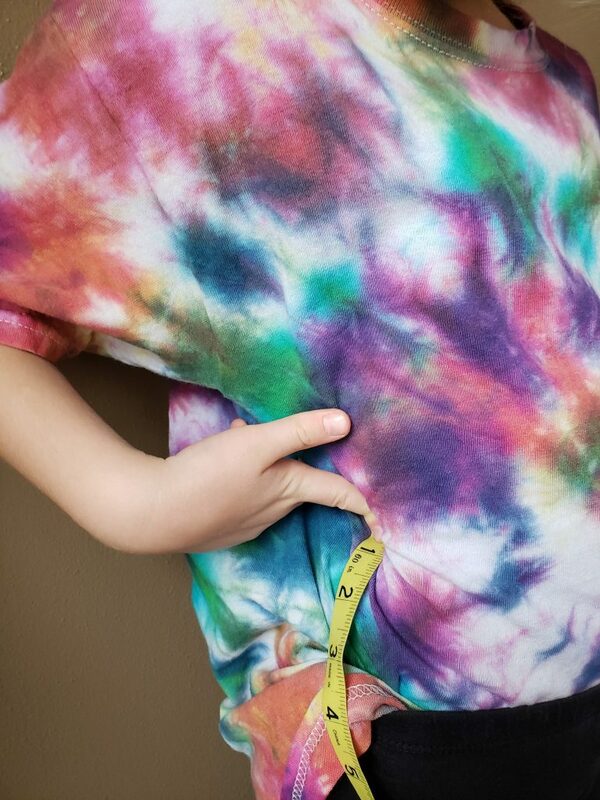 Use the exact waist measurement plus however much you plan to overlap your elastic. You can include a little extra in your overlap so that you can let out the elastic when your child grows. 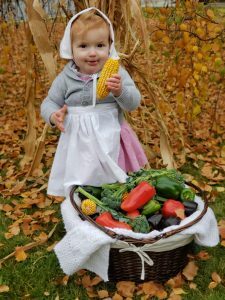 Don’t worry about adding too much, though, because most children grow more in their length than their width. Now that you’ve cut your elastic, safety pin one end of it below the opening you left in the skirt waistband. Put a safety pin through the other end of the elastic. This is the end you are going to feed and scrunch through the elastic casing. Keep inch-worming your fabric over the safety pin. 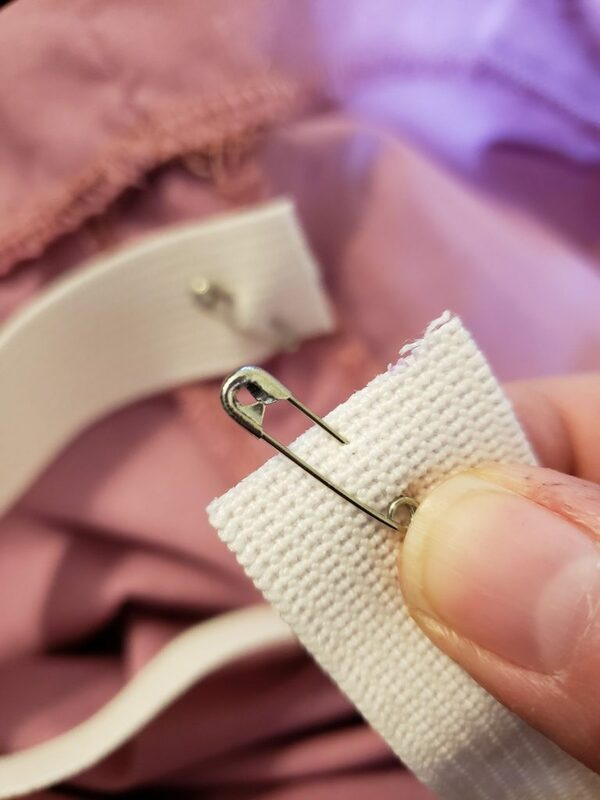 You may need to finesse it a little bit through the side seams, as the seams can sometimes get folded in and catch on the safety pin. Finish working the safety pin all the way through the casing, remove the safety pins, and overlap the ends of your elastic the desired amount. Make sure you don’t have a twist in your elastic! There are several different ways to stitch the elastic together. I prefer to do it in a big square or rectangle. This provides a lot of surface area that is anchored together with stitches, plus it is smooth. 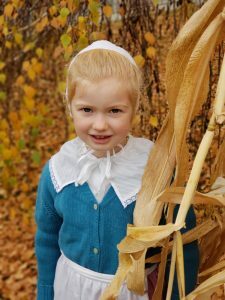 I also use fairly large stitches in case I want to adjust the waist at a future date. It’s a pain to try to remove tiny stitches from elastic. It’s easy to accidentally snag and cut the elastic itself if the stitches are too small. Tuck this elastic back into the waistband casing and stitch the casing opening closed. Now, all you have to do is hem your skirt to your preferred length! These king-size pillowcases were quite a bit too long for Emma. I didn’t want to cut the pillowcases to length, though, because that would prevent her from wearing the skirt when she gets older. (For this reason, avoid cutting costume hems to shorter lengths whenever possible!!!) 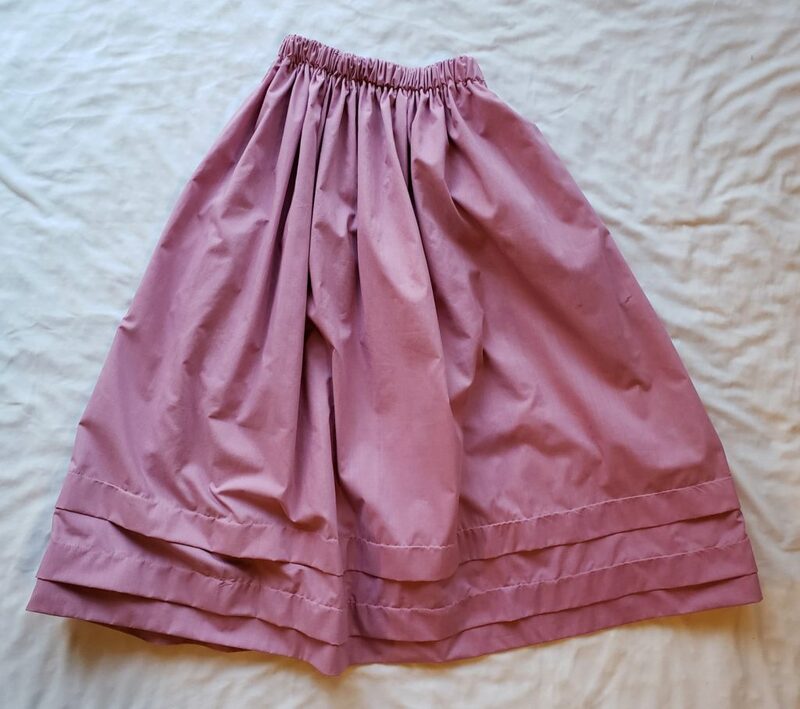 I did need to make the skirt a lot shorter, though, so I began by folding its current finished edge over on itself and stitching that down. This made a deep hem. I knew this would give the hem some stiffness that would help the skirt stand out and look fuller. I considered this a plus! Then, I began the simple but tedious process of measuring, marking, pinning, and sewing two, large growth tucks. This takes a little bit of calculating (Sometimes I have to do math. *sigh*) so you get the finished length right and so that the tucks end up spaced apart from each other and from the hem in the way that you want. Do you see my lovely calculations on that bit of scratch paper, above? The first time I tried tucks on a project, over five years ago, my tucks ended up closer together than I intended. Even here, you can see that I spaced my tucks differently on each skirt. I think I prefer how they turned out on Eliza’s. Once you get those tucks stitched how you want them, press those puppies flat! …and here’s a rear view of Eliza’s skirt. 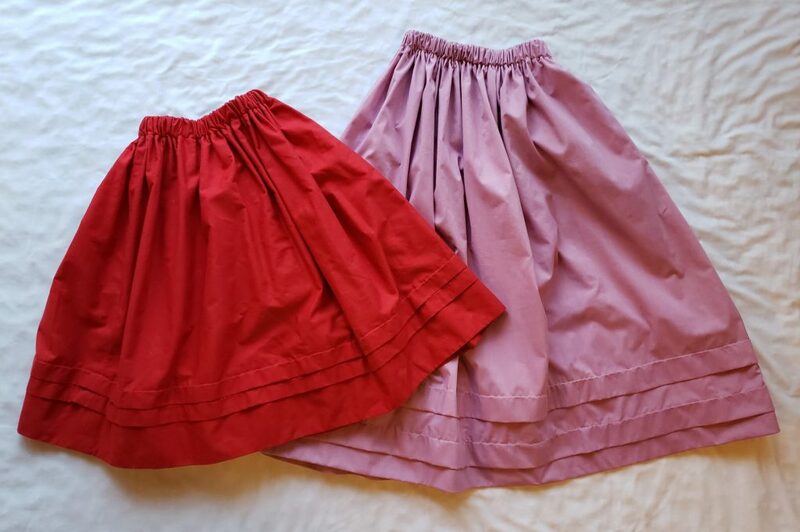 If you really want to be an over-achiever, you can make 2-3 petticoats, in the same manner, to go under these skirts. I skipped that step, this time. However, I am hoping to gradually make a collection of historically-accurate undergarments during these next few years. Correct undergarments do make a big difference in how top-layer garments look and in how they affect the posture and movement of the wearers. This is really important for educational purposes and for actors who are refining what their characters can physically do on stage! 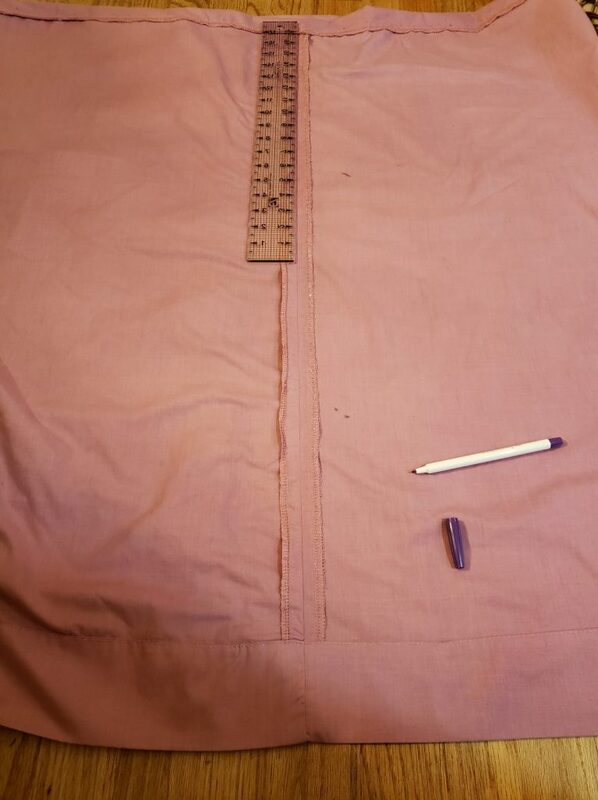 Hem skirt to correct length. Use tucks if necessary. You’re done! This project might get a little tedious, but you will thank yourself when you complete it. You are going to use this versatile skirt a LOT! 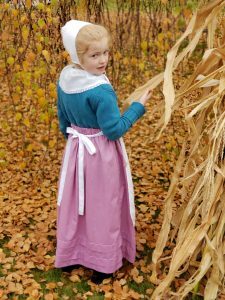 Ready to make some easy, inexpensive, and versatile costume skirts that can cover multiple time-periods? Then this is the tutorial for you! 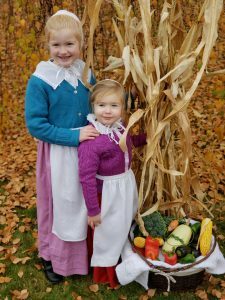 Plus, these costumes are easy to customize (Say that fast five times!) and can be easily altered to grow with your child. *Disclaimer* These skirts are intended to achieve the effect of historical clothing, but I “cheated” a lot. 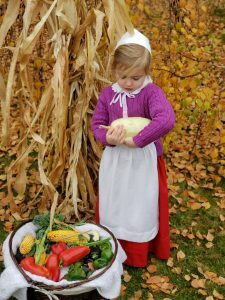 I used elastic in the waistbands, and the fiber contents of these particular pillowcases were cotton and a polycotton blend, which would not have been used in Stuart times. They would have used wool or linen. However, the main goal in my projects is to achieve the correct silhouette and to use historically accurate colors for a time period. Exact reproductions are beyond my scope and budget, at this point. 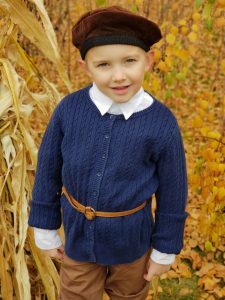 Speaking of period-appropriate colors, The Tudor Tailor is a fabulous resource to learn the historical context for the colors and materials used in this period and much, much more! 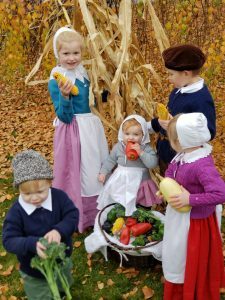 Well, technically, the Tudor dynasty ended with the death of Queen Elizabeth I in 1603, and the Pilgrims came to America in 1620. These dates are so close together that much of the information in The Tudor Tailor is still appropriate for events that happened during the reign of the first monarch of the Stuart dynasty, James I. *Disclaimer* I am an Amazon Services LLC Associates Program member. Any purchases made through my Amazon links will earn me a small commission. I am careful to only promote products that I have personally used and love! I hope I didn’t lose you during the history lesson! I could talk about that stuff all day. Okay, back to the skirts! 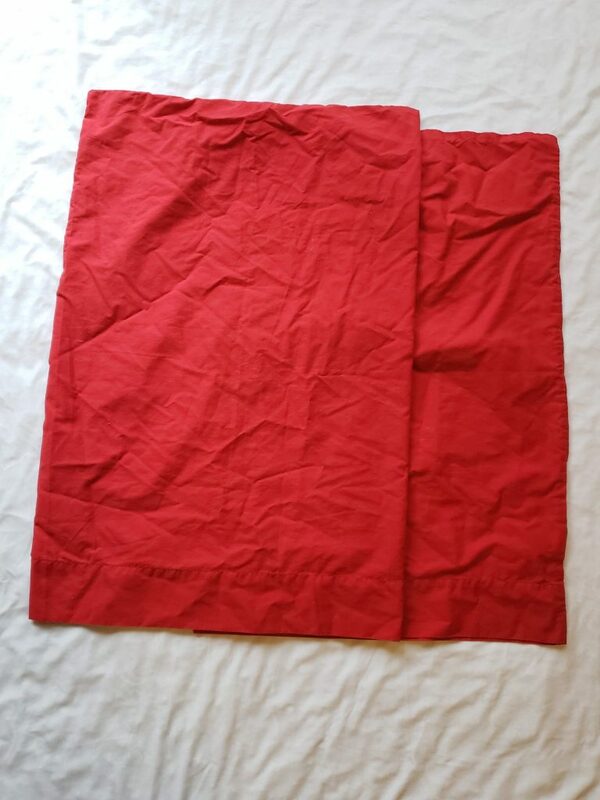 First, you’re going to need two, matching pillowcases. You might already have some in your linen closet that could be sacrificed for this project. It’s okay if they’re a bit dingy or stained. Consider it added realism! In the biz, we sometimes “distress” costumes on purpose. Plus, you may decide to dye your pillowcases, anyway. Dye can cover a multitude of flaws! 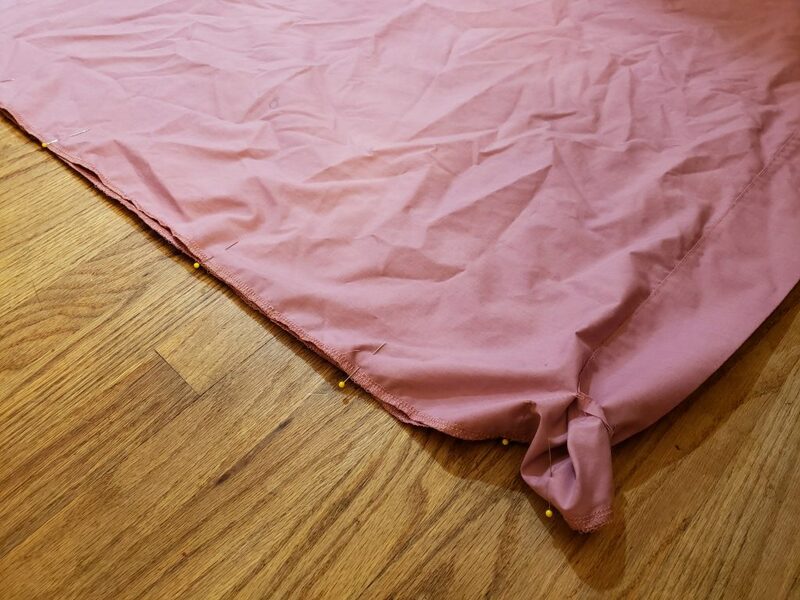 Of course, you could also use regular fabric instead of pillowcase material, but I find that it often saves time on planning and cutting to use materials that are already the needed shape(s). You also end up with less waste at the end of a project. I found these pillowcase sets at my favorite thrift store. The pink, king-size ones were $1 each and the red, standard-size ones were 50 cents each. 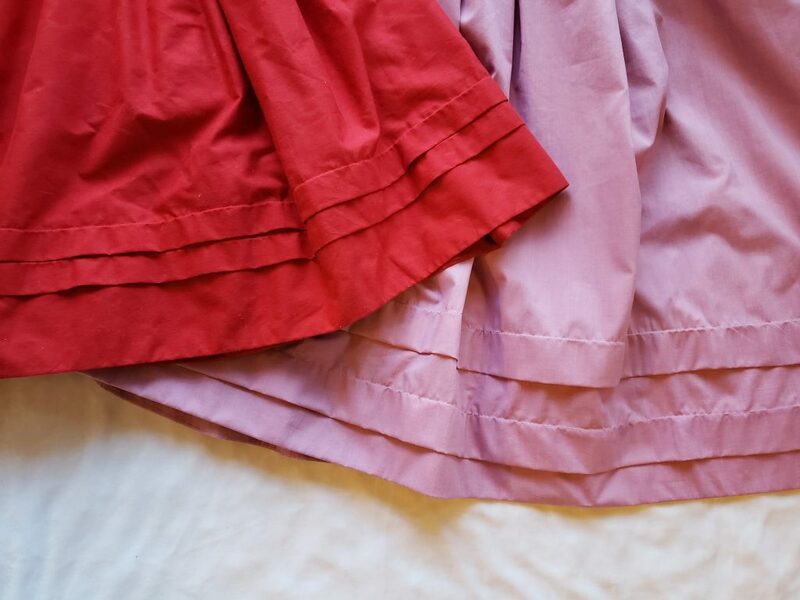 I used the longer, pink pillowcases for Emma’s skirt and the standard-size red ones for Eliza. (Red is Eliza’s favorite color.) 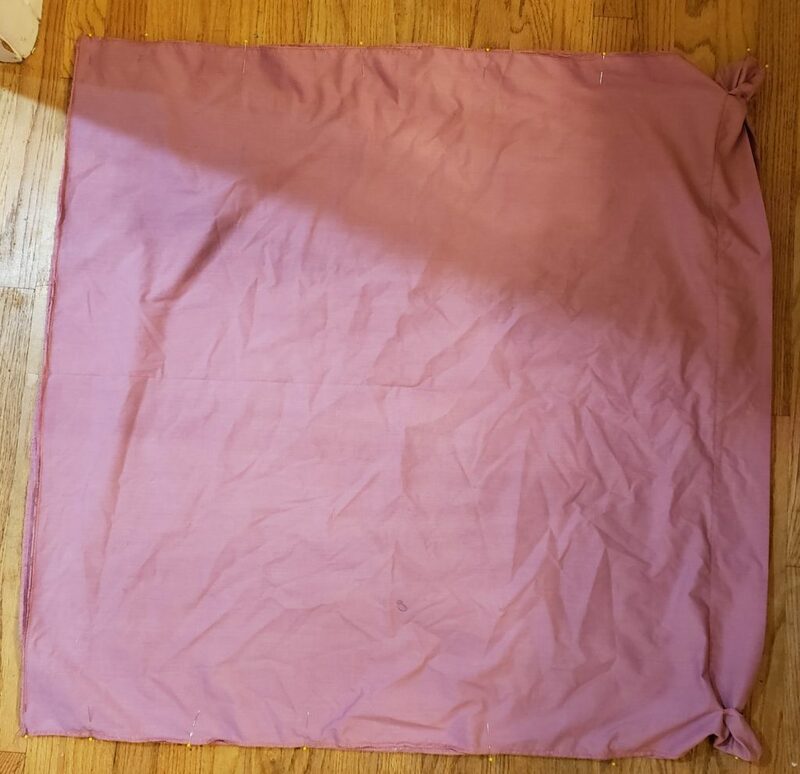 Emma’s pillowcases were a bit too ’90s pastel “dusty rose” for me, so decided to make them a bit more mauve. 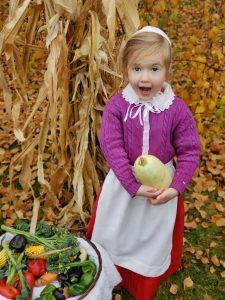 I was already planning on dying another dress and pillowcase purple for Eliza’s Maid Marian Halloween costume. So, I threw all four items in our washer to dye them at the same time. 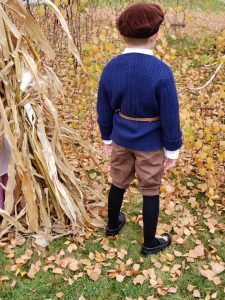 All of these items were polycotton blends, so I knew it would take more dye to achieve the desired effect than if the items were made of more absorbent, all-natural fibers, like cotton. 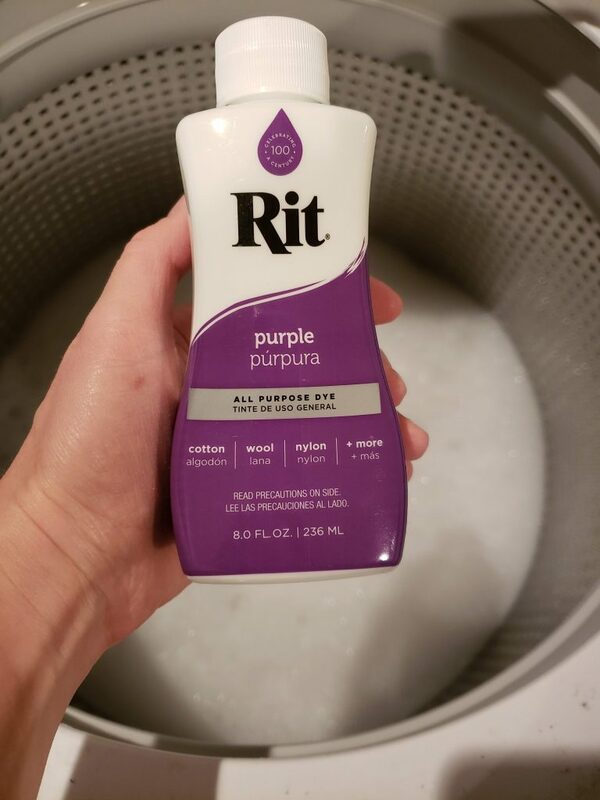 Where do you find Rit Dye? Many grocery stores carry at least a few, basic colors. I find the widest selection of colors at JoAnn (their physical stores have way more than what is represented on their website). However, Rit Dye is cheapest at Walmart. Their color selection in their physical stores isn’t as good as Joann’s, but I buy dye there as often as I can, since I use a lot of it! This purple is a strong, dark color, so I decided to start with using half the bottle. I reasoned that I could always do another cycle with more dye if my items turned out too light during my first go-around. I set our washer to fill with hot water and then set a timer to come back in seven minutes. (That’s about how long it takes for our washer to fill before it begins the wash part of its cycle.) 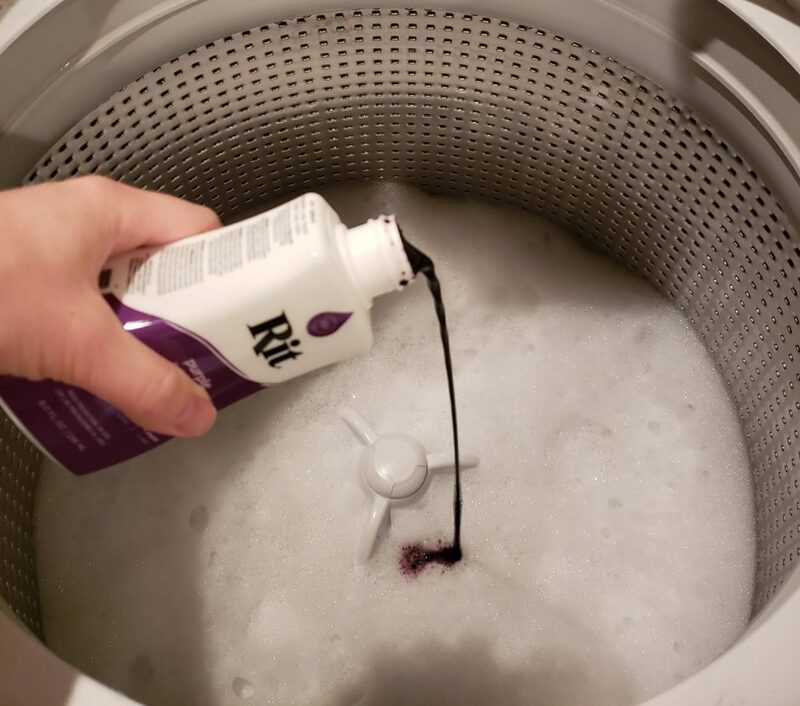 Once the washer finished filling, I paused the machine, opened the lid, and added a splash of detergent and half of the bottle of dye to the water. Then, I added about 1 cup (or about half of a 26-oz container) of salt to the dye bath. Salt is cheap everywhere, but the best deal I’ve found are the 26-oz containers of salt that you can get for 50 cents at the Dollar Tree! 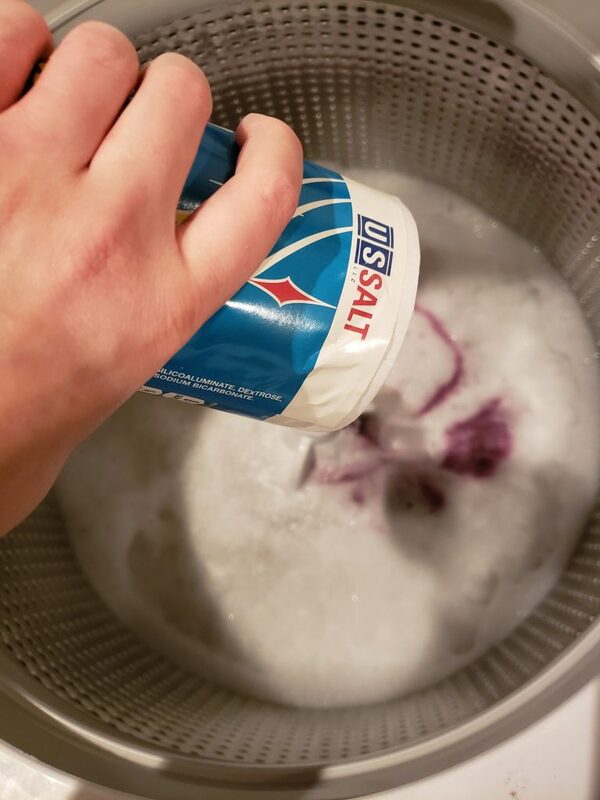 I closed the lid and resumed the wash cycle for a couple of minutes, to allow the detergent, dye, and salt to mix. In the meanwhile, I soaked all the items I planned to dye until they were wet through. 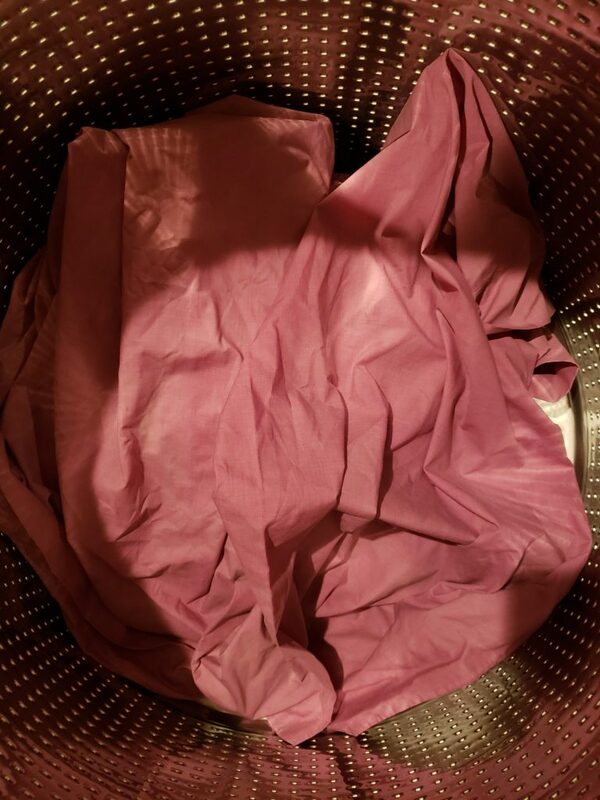 I wrung them out, unfolded them, opened the washer, and lay them on top of the purple suds. I closed the machine and waited for the magic to happen. Okay, I didn’t actually wait. I did 43 things, and then came back when the cycle was done. I just love opening the washer lid after dying something! I feel excitement and suspense, as if I’ve been conducting a magical science experiment. So, as you can see, below, the dyed pillowcases turned out only a little darker than their original color (above). However, this was dark enough for me. I ended up dying Eliza’s Maid Marian costumes pieces, again, using the remaining half of the purple dye in the bottle. 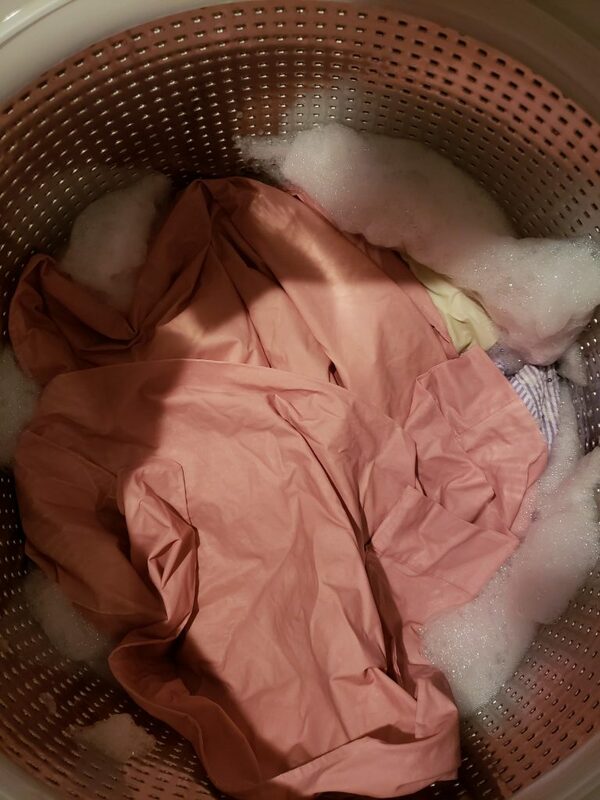 Next, per Rit Dye‘s instructions, I immediately washed my newly-dyed items in cold water with just a bit of detergent and about a cup of white, distilled vinegar. (Vinegar, as well as the salt I added to the initial dye bath, act as mordants to bind the dye to the fabric fibers.) 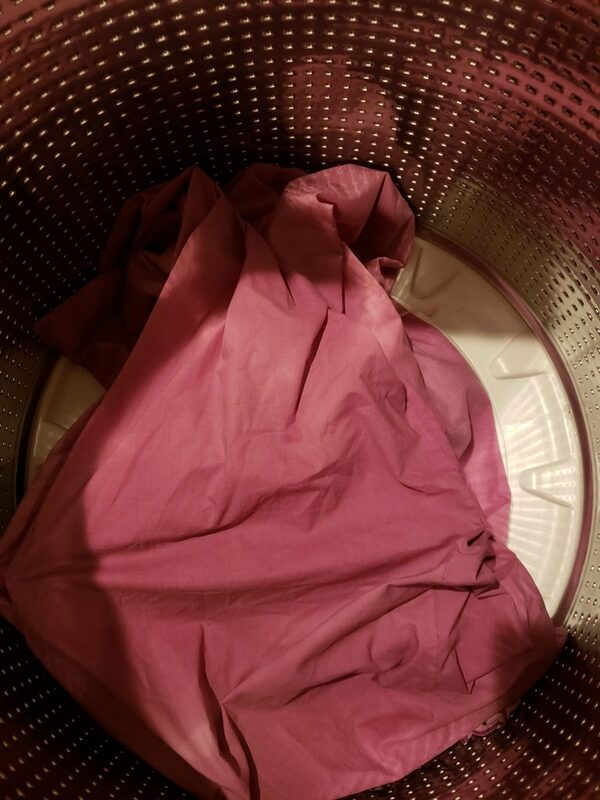 Then, I tossed the dyed and washed pillowcases into the dryer. At this point, I will sometimes wash an empty load with hot water, a bit of detergent, and bleach to clean out the washer. I will especially make a point of doing this if I used a very dark, strong dye color, like a red or a black. A red sock in a load of whites is nothing compared to washing a load of clothes in a washer that still has dye in it! I also *always* wash dyed items separately from other items. Just in case! Speaking of dyeing accidents, do you see some of the flaws and darker splotches on the pillowcase, below? At first, I was dismayed that this happened during the dyeing process. Then, I decided that the imperfections added to the authenticity of the skirt (or could probably be covered with an apron if they really bothered me). Using dye is rather like painting with watercolors. It’s a difficult medium to control, but the end results are often better and more natural than I could achieve if I tried to do certain effects on purpose. Take a deep breath and embrace the unknown! Whew! This got long. I am going to break this tutorial into two blog posts. 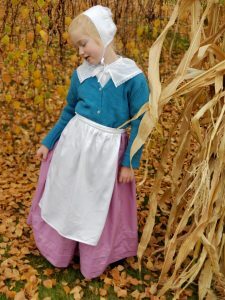 Hop over to DIY Pilgrim Skirts from Pillowcases – Part 2 when you’re ready or if you want to just scroll down to the bullet list of steps at the end of that post. 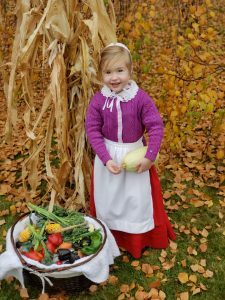 These are cornstalks and vegetables harvested from our own garden! 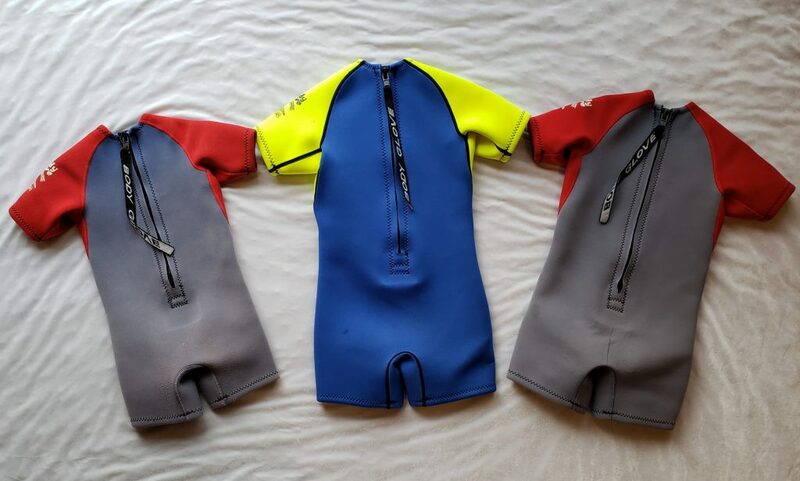 What do cardigans, pillowcases and wet suits have in common? 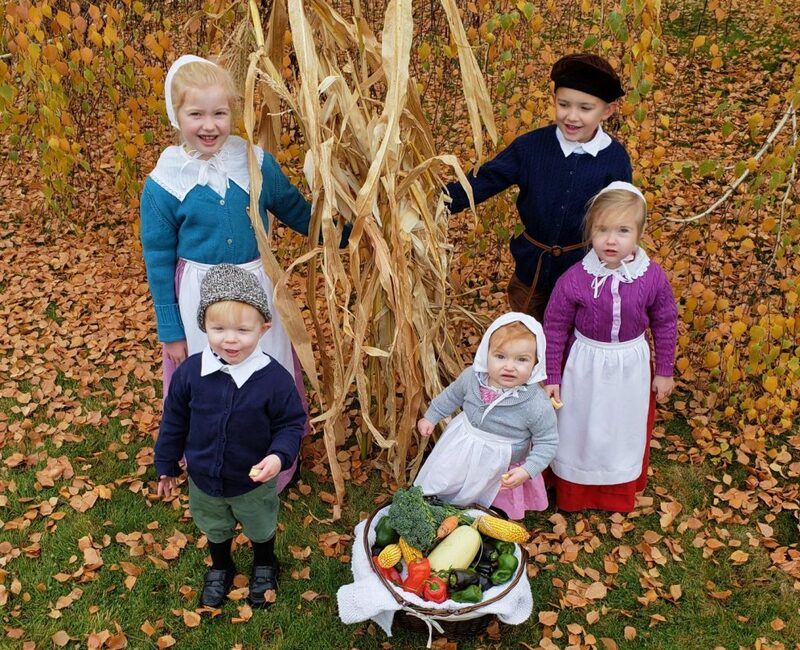 One very chilly Pilgrim photo shoot! Yes, you heard that right. These photos were made possible by Neoprene. 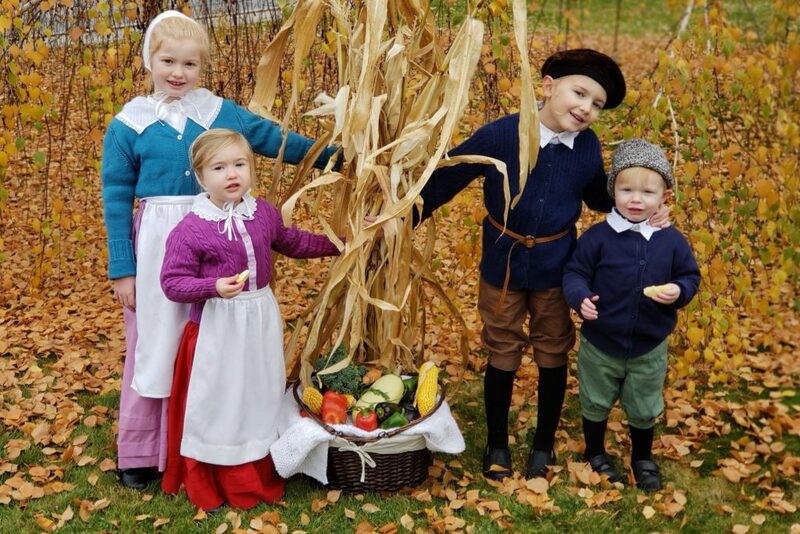 I mean, it was 35 degrees Fahrenheit, and I couldn’t exactly have the kids wear their ski jackets over their Pilgrim costumes, right? So, what did I turn to? The things you wear when you do the OTHER kind of skiing. Water skiing. This would be a cooler story if I told you that we actually take the kids water skiing. But we don’t. 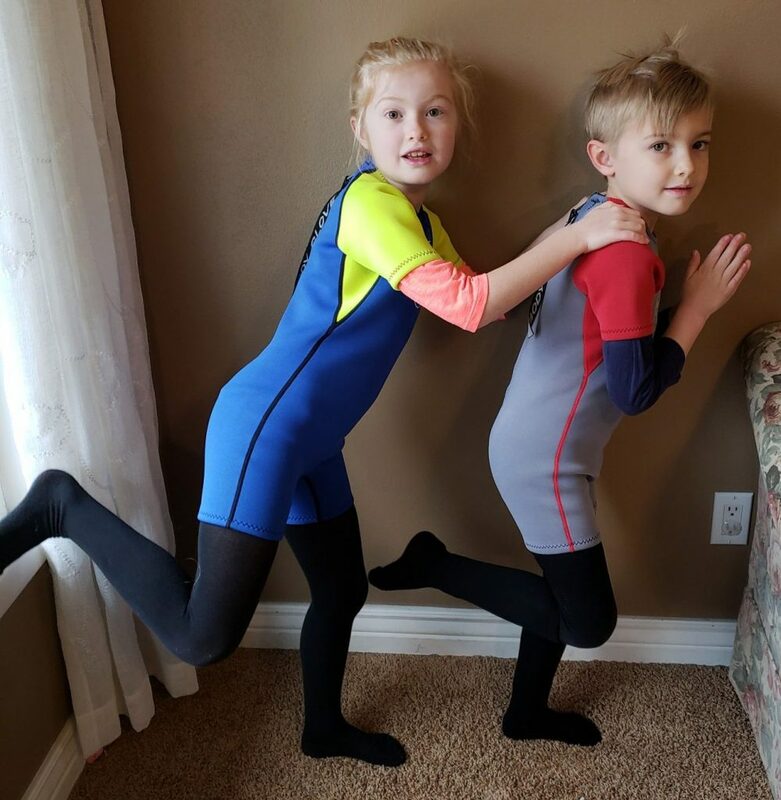 These wet suits are hand-me-downs from more adventurous relatives. Sadly, we have never used them for their intended purpose. However, I thought they would be the perfect base layers for our time-travel adventure! Except if a child has to go to the bathroom. Which totally happened. 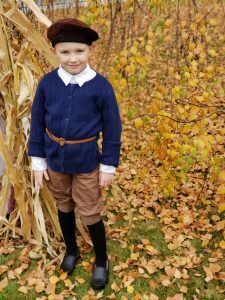 I *may* have put our marriage to the test, when, after Jeff sweetly helped me dress all the kids (it took an hour and I collapsed into giggles when he inadvertently put Eliza’s cap on upside down and backwards) Eliza announced that she had to go potty. We had to take everything off of her and then put it all back on again. Wah wah. 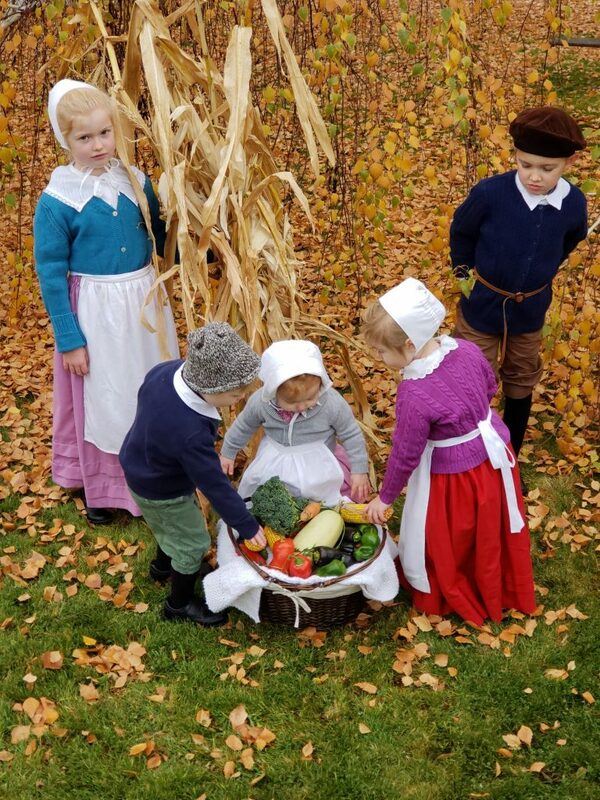 The garden vegetables look like mere props, but I actually put them there so that the kids would have something interesting to interact with and to KEEP. THEM. IN. THE. SHOT. 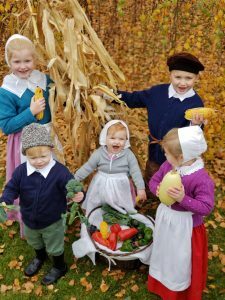 Photographing all five of our children is nearly impossible! Fortunately, Emma and Elliott can be counted on to take great photos. 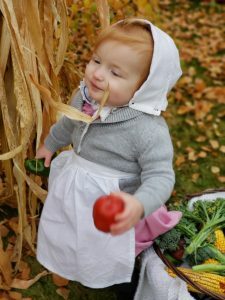 Eliza is our little clown. Her expressions drive us nuts and make us laugh whenever we try to take her picture! Oliver is also a wild card. He was only in it for the apple slices. (Another period-appropriate distraction that I thought would be okay if it was seen in the pictures. 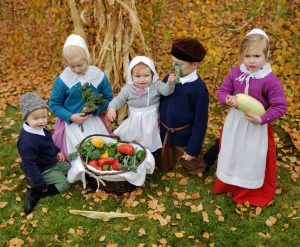 Come to think of it, Annika didn’t dig the photo shoot, either. First, she was hungry. 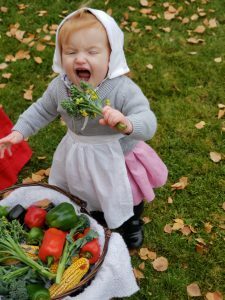 Then, she was hangry. Then, she was just plain angry! 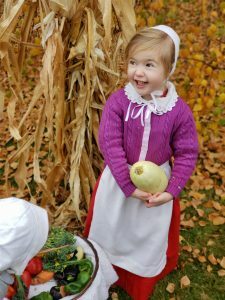 Eliza had also had enough. 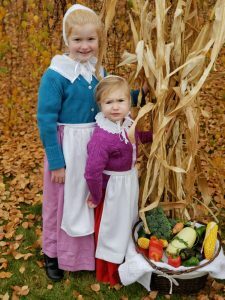 It can be disheartening to spend a bunch of time making costumes, only to have the kids not want to cooperate for photos. However, the good pictures of their sweet little faces make all the hard work worthwhile! 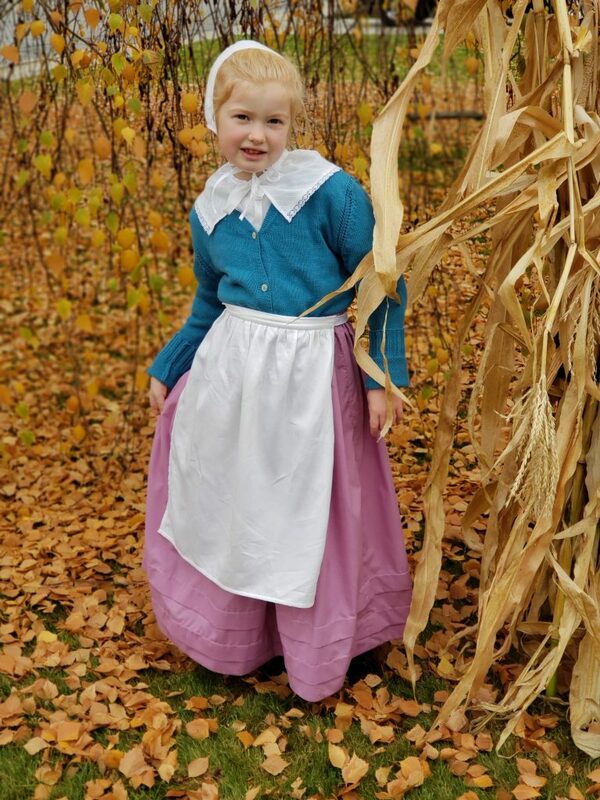 Stay tuned, because I will be making more posts about how I made some of these Pilgrim costume pieces from scratch and/or how I dyed and re-purposed them!